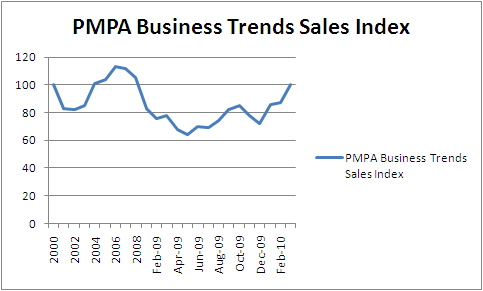 The PMPA Business Trends Index of Sales for March 2010 reached the 100 mark. This is auspicious because that 100 value means that our sales level in March 2010 is essentially the same as our average sales for the year 2000, which is the base year (2000=100) for our index calculation. Finally back to 2000 sales levels in March of 2010. We have lost a decade! Hooray- because we are up 36 points from the low of May 2009 at 64. Hooray- because we are achieving those year 2000 sales numbers with the lessons we learned during the lost decade: lean operations, lean setups, cellular operations. Working smarter. Maximizing use of our equipment’s capability. Tapping the ingenuity of our savvy employees. During the lost decade, we learned which jobs we could do where we added sufficient value to be the manufacturer. And which jobs were of so little value added that they would inevitably be made in low cost economies. During the lost decade, I think we also learned the lesson that some customers are bullies and not profitable- more difficulties than they are worth. And as we continue our lunge to profitability, I am seeing many signs that our industry knows what to do with those customers. Arrogant demands get their due. This entry was posted on Wednesday, April 21st, 2010 at 5:56 am and is filed under Engineering, Front Office. You can follow any responses to this entry through the RSS 2.0 feed. You can leave a response, or trackback from your own site.